If time is an infinite cord, we wanted to pinch it so that our tone could wave through the ages until one of you walks on the planet Mars for the first time in human history. Maybe you will look back in the past to understand what it took to make this singular moment to happen, and perhaps you will see us (and so many others). 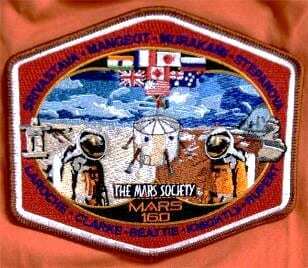 We were a group of people, representing eight nations, dreaming to reach Mars! We enlisted for this program hoping to make our way to the Red Planet for some of us or to make significant progress in knowledge needed to reach it for others. As commander of the Mars 160 expeditions, I had the privilege of compiling my crew mates’ memories in this letter. The lines below represent the quintessence of their thoughts, narrating our story and feelings. To view the crew’s final comments and views about their simulated Mars mission, please download: http://mars160.marssociety.org/wp-content/uploads/2017/09/Dear-Martian-friends.pdf.